2. Owned media marketing, on the other hand, involves leveraging owned marketing assets to obtain users. Examples of owned media assets include email messages, SMS, QR codes, and rewarded user invite communications. User acquisition campaigns harnessing owned media assets might include converting existing web users to app users via email targeting, or adding user invite banners in a game to encourage sharing with friends in return for in-game currency. 3. App Store Optimization (ASO) is an important activity under the marketing budget meant to boost organic installs and thus an important part of user acquisition. The equivalent of the web’s SEO, ASO focuses on optimizing an app’s store page headline, description, keywords, and other components to boost app store rankings. ASO usually falls under the responsibilities of the UA manager, and it can either be done in-house or serviced via an external ASO agency. 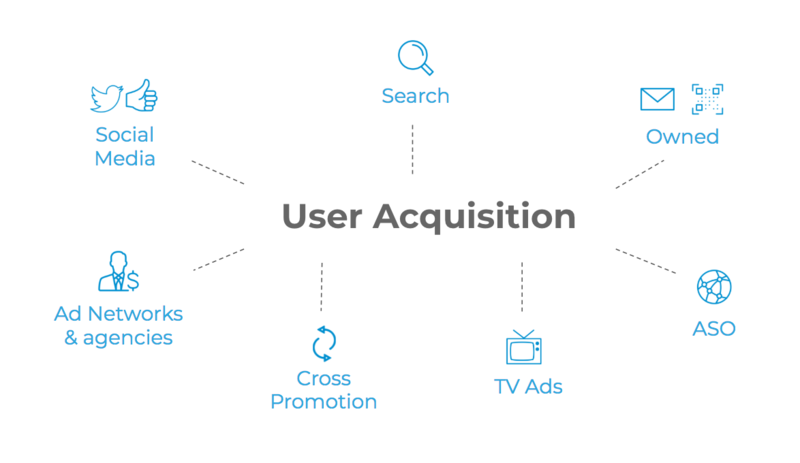 Why is user acquisition important? Simply put, growth is one half of the core of any mobile business, as they all rely on acquiring new users and maximizing their value to succeed. In the freemium-dominated app space, where the majority of apps are free to download and use, it is essential to increase app scale to also increase the roughly 5% minority of users who will contribute to your in-app purchase revenue. The number’s game is also important considering the fact that many users an app will acquire will either stop using it after a short time or uninstall completely. Therefore, while retargeting and re-engagement campaigns play a large role in retaining users, a strong user acquisition strategy will keep new, high quality users flowing in the first place. User acquisition is also vital to accommodating the recent decline in organic installs the mobile ecosystem has seen. Given the ever-growing amount of total apps worldwide (3.8 million in Google Play and 2 million in the Apple App Store as of 2018), driving organic installs at scale is becoming extremely challenging. User acquisition fills in the gaps left by reduced organic activity – these days, with the intense competition that exists, as a marketer, you have to spend money to make money. You can do that by relying on data to ensure your investment is worthwhile. Lastly, a good user acquisition strategy serves as a boost to your app store rankings, as the number of installs is a factor in the store algorithms (in recent years, its weight has reduced in favor of more quality-driven metrics like ratings, reviews, uninstalls and engagement). While it is becoming harder and harder to get organic users from app stores, install volume — particularly driven by non-organic installs, which are controlled by marketers and their budgets — is still useful in raising an app’s ranking. As a result, there is a greater opportunity for an increase in the number of organic installs and ultimately attracting more higher quality organic users that will help keep your app profitable. In short, a well-planned and executed user acquisition strategy will lead to increasing revenue from your company’s offerings and is essential to success. How do I optimize for high user acquisition? Successful user acquisition is extremely reliant on continuous data-driven optimization. It is especially driven by ongoing testing and re-adjustment of campaigns with time. Ultimately, the purpose of data in user acquisition is to identify the trends and patterns that work for your app and goals, which means not designing an effective user acquisition plan will leave you guessing, and ultimately wasting money. With the shift from quantity to quality – that is, focusing more on post-install user engagement to inform future user acquisition – marketers must rely on mobile measurement and attribution tools to pinpoint the sources of the highest quality users and zero in on their strongest performers to allocate future budgeting. Even with, or especially because of, a limited budget, spending more time with your attribution data will help you scale both your organic and non-organic traffic and ensure your marketing investment consistently comes back… with interest.